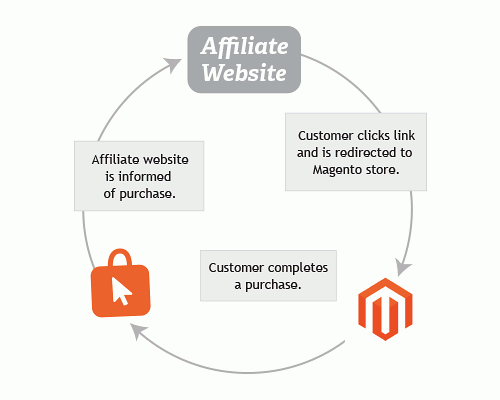 In this tutorial, we will create a Magento module that will capture an affiliate referral from a third-party source (e.g. an external website or newsletter) and include a HTML script on the checkout success page once this referral has been converted. Creating a community module with no hard-coded settings. As always, this module will be written in such a way that no core files are modified, making it portable and Magento-upgrade friendly. This tutorial assumes you are already familiar with the basics of creating a Magento module, and builds upon the points covered in our previous article on the Magento Layout, so it might be worth brushing up on both if you are not familiar with either. We will be adding any website-specific settings as configurable options in the Magento admin panel, and as a result, our module is a “community module” whose code belongs in app/code/community, the idea being that we can drop this community module onto any Magento instance, and no code modification will be required to get it working. To begin with, create the following file structure with empty files ready to be populated later. The first task of an affiliate-tracking process is to capture the referral, which is generally provided as a $_GET parameter in a URI from a third-party website or newsletter. For example smashingmagazine.com/&quest;utm_source=some_affiliate_id where some_affiliate is the ID of the affiliate we will reward if our customer completes a purchase. We want our affiliates to be able to link to any page of our website, so that our customers can click directly to the product or service of interest. Therefore, we need a method of checking for this $_GET parameter on every page. As always, we don’t want to modify any Magento core code since we want our module to be as portable and upgrade-friendly as possible, so we will be using an event observer. One event that is dispatched on every page is controller_front_init_before, so let’s create our config.xml with an observer for this event. In the above code, we are calling getRequest() to retrieve the Mage_Core_Controller_Request_Http instance from the controller, which will contain all of the information we need about the current URI request, including any $_POST or $_GET parameters. We are interested in the $_GET parameter utm_source, and we can retrieve its value with the getParam() method. If present in the current URI, the variable $utmSource will now contain our referring affiliate’s ID. We have defined a new constant, COOKIE_KEY_SOURCE, because we will be referencing this same value from a different class. When referencing a value like this from multiple locations, it is good practice to use a constant. This way, we keep refactoring work to a minimum should the value ever need to change. We have also defined a new protected method, _getCookieLifetime(), for retrieving the cookie lifetime, which we have hard coded to 30 days from now. There are, of course, other methods of updating affiliates, for example via server-side API calls which can be achieved with further event observers, but for this tutorial we will utilize the Magento layout to introduce some custom HTML at the bottom of the order success page. At this point, we have a working module. All of our functionality is in place, and our hard-coded values will work for a single instance of Magento. We have the equivalent of a local module. The next step is to move these hard-coded values into the Magento admin panel, so they can be configured on multiple Magento instances without any code modification required. It is quite straightforward to add items to the Magento admin panel system configuration, and it’s ideal for saving website-specific credentials or settings, like in our case the merchant ID and cookie timeout value. Now, let’s log in to the Magento admin panel and navigate to System → Configuration using the main menu. We can see a number of tabs on the left-hand side for configuring the various elements of our Magento instance, such as “General,” “Web,” “Design,” etc. We are now going to add a new tab for our module’s configuration items. Note: When making changes to the ACL, if you are already logged in to Magento you will have to log out and back in again for the new permissions to take effect. You may find you get a “404 page not found” when you try to access a newly-added tab that you do not have ACL access to. The system/config/path should be replaced with the configuration path to the particular setting you are interested in. For example, the path to our merchant_id setting would be smashingmagazine_affiliate/general/merchant_id. With this simple modification to our template, conversion.phtml, we can prevent the image from appearing on the checkout success page if the module status is disabled in the Magento admin panel. Similar if statements can be added in Observer.php to prevent the affiliate cookie being checked for and saved. By carefully considering the way we structure our code, and utilizing the Magento admin panel, we can create community modules that are portable enough to simply drop on to any Magento website and they will work out of the box. They can then be customized and fine tuned as required to suit the needs of each website. Feel free to view or download the source code (Github), and, as always, I welcome any questions and would love to hear any feedback in the comments area below.